We deliver to Miami University and Oxford, oh daily. 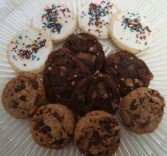 Click link for Homebaked goods . We have brownies, brownie cakes, cupcake cakes, chocolate chip ,iced sugar, cheesecakes, etc. BUTTERCREAM ICING. NEED 30 HOUR NOTICE FOR DELIVERY. We will look at enclosure card and write Happy Birthday to the name of your son or daughter or wife etc. Or you can let us know what you would like us to write on it in the additional information area as you check out. BUTTERCREAM ICING! NEED 30 HOUR NOTICE FOR DELIVERY. 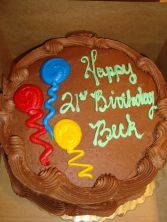 We will write on the cake Happy Birthday to the name of the person it is being delivered to. If you would like us to write something else on the cake just let us know when checking out in the additional information area provided.